Cactus Rock is impressive, but I still have trouble believing that picnic parties would come up there regularly; it’s 1000 feet and almost a 200-foot climb from Broadway Terrace. The climb to “Mount Ararat” would have been shorter; but I still lack evidence that a large rock sits up there. Click the photo for a larger view. You can’t quite see it, but the rock beneath the porch now has a fountain installed that spills in a waterfall over it into a pool. 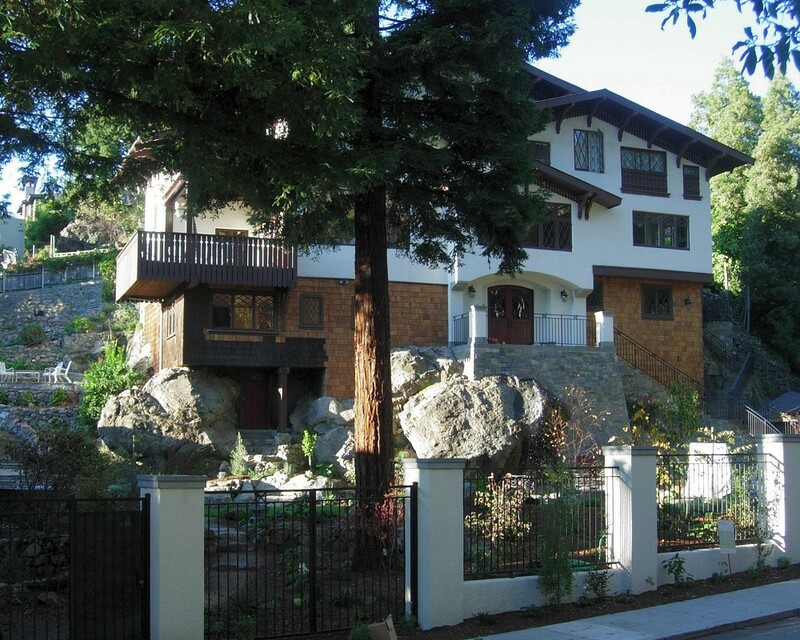 Could this house be sitting on the original Rockridge Rock? This entry was posted on 21 November 2010 at 3:41 pm and is filed under Franciscan rocks, Oakland geology puzzles. You can follow any responses to this entry through the RSS 2.0 feed. You can skip to the end and leave a response. Pinging is currently not allowed.